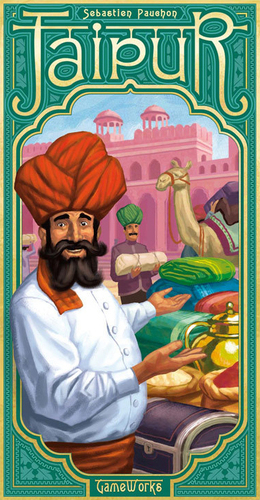 Jaipur is a two-player set collection card and trading game. 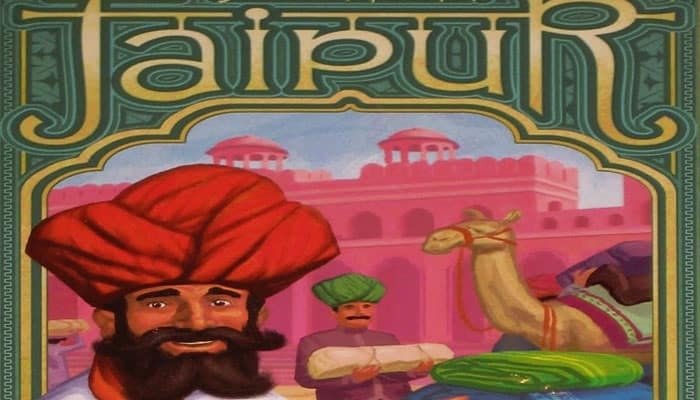 Both players are competing merchants in an Indian city Jaipur, capital of Rajasthan, and striving to be invited to the court of the Maharaja. Players can collect and exchange goods (gold, diamonds, spices, and leather) from the central marketplace and sell them for rupees. Rewards (bonus tokens) are awarded for players who can do good deals. Players must balance the timing to sell. The larger the set, the higher the payout but if you sell earlier, they payout will be higher too. On your turn you can either take cards (goods) or sell cards. You can try to block your opponent from certain goods but the hand limit makes this tough. The game is played in rounds and the best merchant receives a Seal of Excellence. The player who can collect two of them is the winner of the game. to win the game, you must win at least two rounds. Sometimes there are fewer tokens available than cards during a sale. In that case, you still receive the bonus token for the number of cards sold. The use of the camels is a balancing act: if you don't have any then you have a problem if you want to take a lot of cards and your hand is empty. However, if you take a lot of camels then you risk leaving a very profitable market for your opponent.